The MSA’s U18 policy sets out the governing body’s position with regard to young competitors and establishes the importance of maintaining their education while competing. 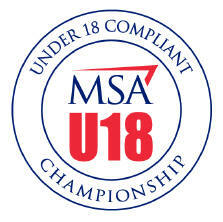 The MSA will designate as ‘U18-compliant’ those championships and events that commit to uphold the principles outlined in the MSA’s U18 Policy. As part of the training and development programme of the MSA Academy, the MSA will deliver a series of Performance Master Classes free of charge to young competitors at selected events. whose investment enables the educational message to be spread as widely as possible among young motor sport competitors. the welfare, development and education of young participants in motor sport. students who are legally obliged to continue in full-time education. precedence over motor sport activity. conflict with educational commitments wherever possible. provide the highest possible standards of care when given responsibility for young people. selection, suitability and deployment of individuals working with young people in motor sport. Criminal Records Bureau (CRB) check at enhanced level. • The MSA has contracted TMG CRB to undertake the CRB checking process on its behalf. adopted the FIA’s Anti-Doping Protocols. they make when signing their licence application form. for the Go Motorsport campaign. by means of official presentations to primary and secondary schools. to have a first taste of karting for just £5 at venues across the UK.